Oxidation-reduction phenomena are very important in every area of water treatment whenever (either as an impurity to be eliminated or as a treatment reagent) elements are involved that are capable of changing the oxidation number (or valency): carbon, nitrogen, sulphur, iron, manganese, chrome, arsenic, chlorine, ozone, etc. In the first case, the water is a donor of electrons; it is a reducing agent: the electrons acceptor is an oxidant and oxygen is formed. In the second case, water is an electrons acceptor; it is an oxidant: the electrons donor is a reducing agent and hydrogen is released. But without catalysts, the reactions are very slow and, from an oxidation-reduction perspective, generally you can disregard the action water has. Generally speaking, a weak acid solution’s buffer power is effective for an acid/salt concentrations ratio ranging from 0.1 to 10 and pH = pKa ± 1. Note: The simultaneous presence of free carbon dioxide and of alkaline or alkaline-earth hydrogen carbonates (bicarbonates) in water provides it with a very useful buffer power, particularly when it is coagulated by a salt with an acid reaction (see typical reagents). Conventionally, the reaction’s standard free enthalpy variation is nil if the hydrogen pressure equals 1 atm and if the [H3O+] ion concentration is 1 mol.L-1. where F is Faraday’s constant, R is the perfect gases constant, and E° is the standard potential of the Ox/Red couple corresponding to [Ox] = [Red]. to be possible, E°1 must be greater than E°2. Certain redox reactions involve protons or hydroxide ions (for example, the oxidation of Fe2+ by MnO4-). 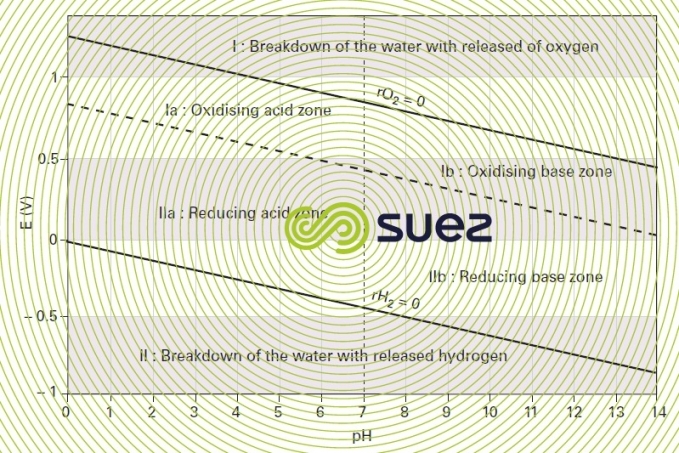 To specify the conditions of these various transformations, you use the potential-pH diagram (or Pourbaix diagram), also known as the stability diagram, because it defines the zones where the various chemical types are thermodynamically stable. The potential varies linearly depending on the pH, and the oxidant and reducing agent concentrations. The lines E as a function of the pH, which are drawn for each concentration value, define the thermodynamic zones of the various types of chemicals, which can be solids, gases or in solution. The diagram outlines both the electrochemical and acid-base equilibriums (n=0). two reducing zones IIa and IIb (acid and base respectively), which are below which are below the same chemical equilibrium line, and are separated by the line pH =7. with oxygen being released and the medium becoming acidified. where EH is the oxidation-reduction potential compared to the standard hydrogen electrode expressed in Volt. 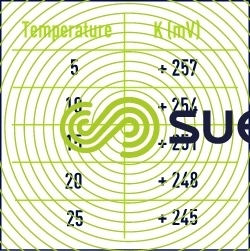 K : constant varying with the temperature according to table 8.